I’m trying to write about Leo’s birthday cake and what I’m finding is, I don’t really care about making cake as much as I used to. However…this is such a great cake! So I’m sharing anyway. We all need a recipe as reliably lovely as this one. A pure and plain expression of the ideal; the crumb sweetly, tenderly vanilla and so delicate. And still there is structure! Not many cakes strike that balance. Not only that, but a person who has baked nothing more than a brownie could easily whip this one out. I promise. I know, I know. 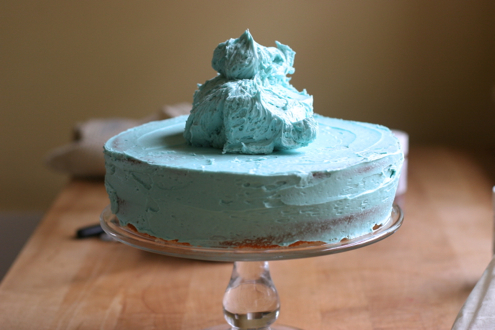 Too bad the frosting had to be blue. Not my choice. I smiled at him, he’s so adorable, but I know this: he’ll take two bites, tops! No offense Leo. Food should not be blue. Not even cake. And hey! Are you really a vanilla/vanilla kid?! What’s with the gumdrops? Have you ever really eaten a gumdrop? Don’t you know they don’t taste very good? It used to be that with birthday cakes, I would veer deeply into Martha territory but now that is in my past. I am finished with complicated. Plain and delicious is what I’m after. No fancy tricks or techniques. 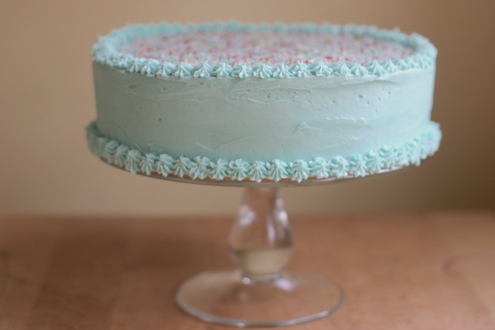 Who needs to prove they can make an Italian meringue or French buttercream? Not me. Kids like the butter and powdered sugar version better anyway and I want Leo to like his cake. Also, I want to like his cake. Like making it, like eating it. And this cake delivers all that. 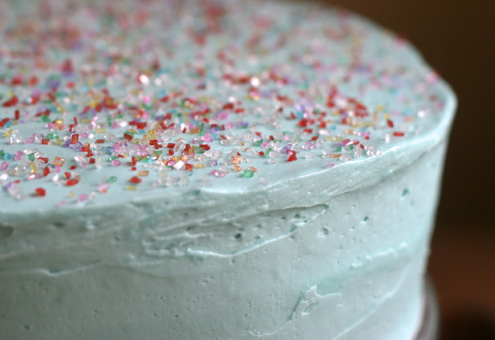 As I couldn’t handle the gumdrops, I substituted India Tree Sparkling Sugar Confetti but I did dye the frosting blue, against my better judgement. And then I broke out a secret weapon: Lemon curd. Leo loves lemons but he’s never had lemon curd. He totally loved his birthday cake – he even ate a whole slice! I loved it too. My favorite birthday cake in years. Pay attention to the temperature of the ingredients – all dairy and eggs should be at room temperature. 1. Set oven racks in upper-middle and lower-middle positions. Preheat oven to 350 degrees. 2. Spray two 9-inch round cake pans with nonstick cooking spray (I used olive oil as it’s all I had and it was fine) and line the bottoms with parchment rounds. Then, spray the rounds, and dust the pans with flour. Flip the pans over and tap them firmly over the sink to remove any excess flour. 3. 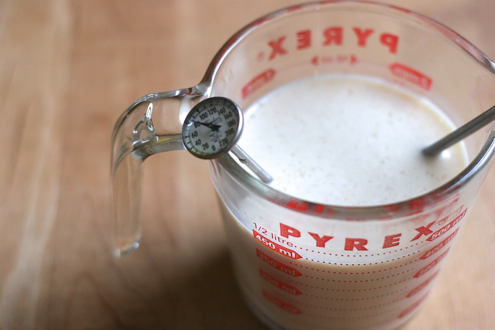 Pour the milk, egg whites, and vanilla into 2-cup liquid measuring cup and mix with fork until blended. 4. 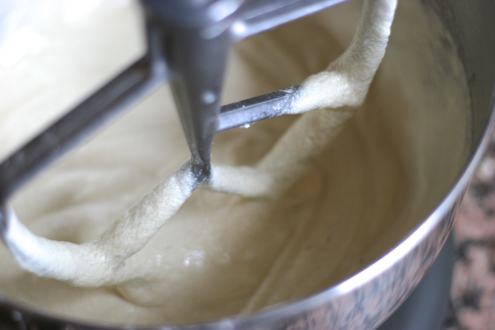 In the bowl of an electric mixer, using the paddle attachment, mix cake flour, sugar, baking powder, and salt at slow speed. 5. Add butter; continue beating slowly until mixture looks like moist crumbs, with no floury streaks remaining. 6. Add all but 1/2 cup of milk mixture to the buttery crumbs and beat together at medium speed for 1 1/2 minutes. Add the rest of the milk mixture and beat for 30 seconds. Stop mixer and scrape sides of bowl. 7. Beat at medium speed for 20 seconds longer. The batter will look slightly curdled. 8. 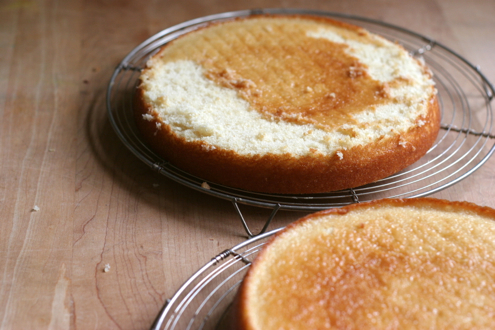 Divide batter evenly between the two cake pans. With a rubber spatula, spread batter out evenly over the pans. Place pans on separate racks in staggered fashion to allow air to circulate. Bake for 23-25 minutes. A thin skewer or toothpick poked into the center should come out clean. 9. Rest the cakes in pans for 3 minutes. Using a small sharp knife, loosen from sides of then invert onto wire racks. Reinvert onto additional wire racks. 10. Cool completely, at least 1 1/2 hours. 1. In a stainless steel or enameled cast iron saucepan, whisk the egg yolks with the sugar until creamy and smoothly blended. 2. Stir in the sugar, lemon juice and butter. 3. Stir over medium low heat, until thickened, so that it thickly coats the back of a spoon – draw your finger through the curd to see if it can hold that line. It should still be pourable. 4. Do NOT boil the curd as then you will have made oddly sweet, lemon-y, scrambled eggs. As soon the mixture has thickened, pour through a fine strainer and press through with your spoon. 5. Stir in the lemon zest and cool. The curd will thicken significantly upon cooling. 6. 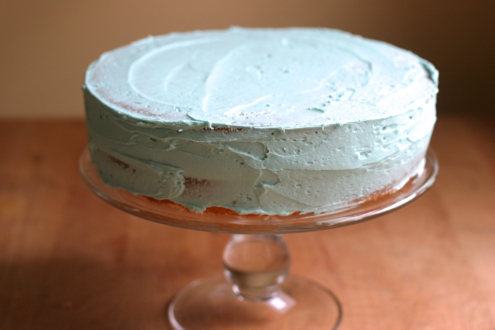 To fill a 9″ cake you will need 1 cup of the curd. But if I were you I would steal a couple of spoonfuls before filling the cake. You could find a buttercream recipe in any book, they’re all about the same. However, you will have to decide how stiff you want the frosting. Add a lot of powdered sugar and the frosting will hold a stiff little star piped obsessively from your piping bag. (Old habits die hard I guess!) Next time, I’ll use less sugar for a swoopier and creamier frosting! 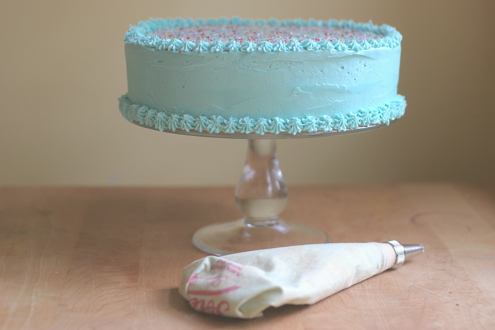 If you are looking for a tutorial on how to frost a cake, look no further than here. Building the dam was life cake changing! 6-8 cups powdered sugar, please sift it! 1. Beat the butter on medium speed with the paddle attachment until it’s broken down into glossy peaks. 3. Add the vanilla, salt and and milk, then increase the speed to medium and beat for 3 minutes. 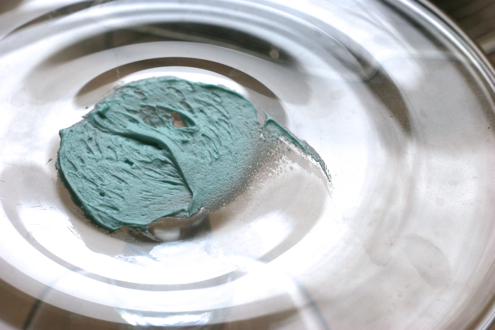 Add the food coloring, if using. 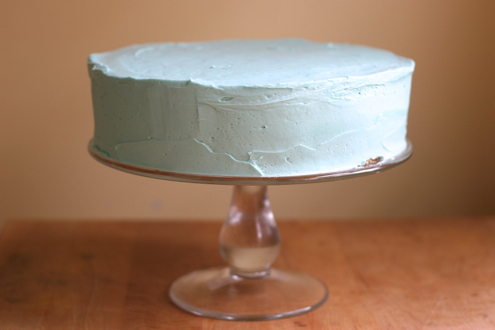 A tablespoon of frosting will help adhere the cake to the stand - no slipping! Why did I not know about the dam before now!? The crumb coat - don't skip this step! This entry was posted in easy, Uncategorized and tagged dessert, easy. Bookmark the permalink. Cake top crunchies! I think Leo needs some of those! Holy bananas! Frosting dam! I just made my sister’s four layer wedding cake and while it came out beautifully (not that I had a bite having a bit of an egg allergy myself), I found myself terribly frustrated with the lemon curd on her bottom layer. I can see why a dam could have the potential to be life changing! What a beautiful cake! 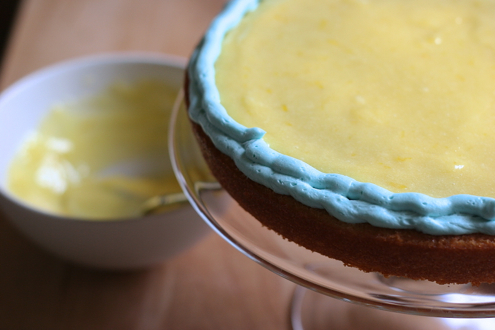 And the lemon curd sounds like the perfect filling. Sarah, you are so good! Another yum! I’ll find a reason to try this. And bring you soup. I laughed. I cried. I ate a lot of biscuits.